It’s been a while now that I stood in front of the Bronfman building’s main entrance at Sherbrooke and admired the history of it all and the legacy that I am a part of. A year, to be precise, since that moment when I ‘looked up’ to realize my existence in front of a building which, in the last few decades, has made many dreams come true. 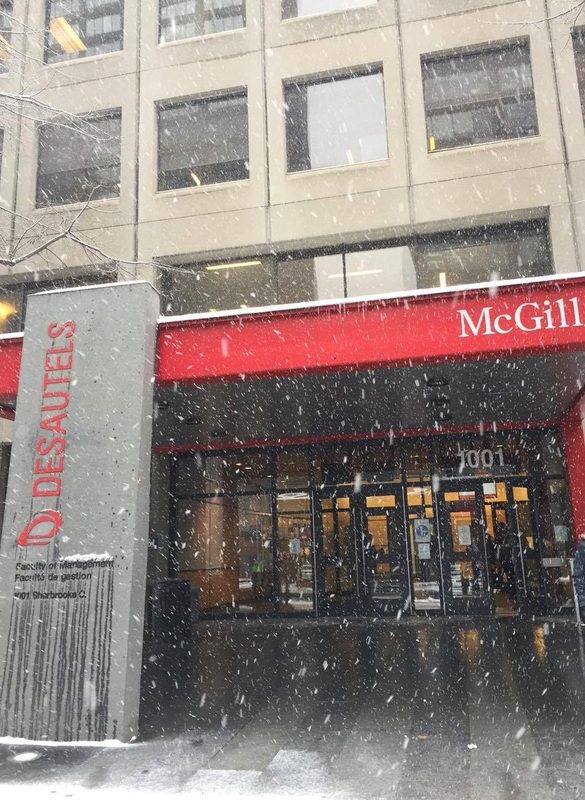 I, like 76 other MBA students, started my MBA at Desautels Faculty of Management in August 2015 and remember when most of us saw the building for the first time, gazing at the red frame shining in the sun, smiling in hope. The construction in front of the gates doesn’t help but we have completely forgotten to stand still, take a breath and look up to the place we are at. The place which has been our home for the last one year. 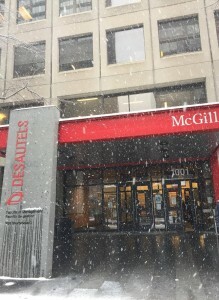 The MBA students at Desautels faculty of Management spend most of their time at the third floor. It is not uncommon for students to spend five or maybe six days a week at that floor attending classes, meeting for group projects, completing assignments, planning for club events, chilling, meeting with faculty, tweaking resumes, flirting, writing cover letters, reading cases, searching incessantly for job postings, writing emails in the name of networking and what not. Just as we fail to notice the significance of the Bronfman building in the midst of it all, we forget that these wonderfully passionate people who are at it day in and day out are life stories which are germinating at the moment in the ‘greenhouse of careers’ that Bronfman building is. Typing away amidst all the anxiousness, loneliness, happiness, irritation, joy, disappointments, deprivation, and other spectrum of feelings that an MBA student goes through what keeps them going is the passion that they came here with (and the fact that the debt is real). A mother of two toils away to learn to apply business strategy and at the same time hopes that the kids are taken good care of by the husband, a husband, living away from his wife with the hope to change careers and can’t travel home on all weekends due to the piling school work, students from the other side of the world are looking to only go back home to meet their dear ones once they have a job that they want, and some students have been experts in their fields, in their country, but change of location has deemed their skill not as valuable. The struggle is real, but at the end of the day (or semester) these, and many more students, still have a smile on their faces because all of us care. The faculty of management brands us as the #DesautelsFamily but it is not just a branding exercise, it is the root of our existence and success at Bronfman. I was speaking to a first year MBA student and he said that despite all the challenges that students face at school and in the Canadian market, the reason that we are still going strong is because “They Care”, the faculty cares for each student. No matter what the circumstance, the students of our MBA program should learn one thing- to “Take Care” of their surroundings and the people in them. The students of the #DesautelsFamily, in my opinion, don’t necessarily want to take over the world, but to “make the world a better place” and it’s happening right here at the Bronfman building. Finally, the construction in front of Bronfman building has stopped and I finally got a chance to stand still, this time in the snow, and admire the house of our big family. Visit us sometime. Published by akshaykohli on 2016/11/27 at 10:57 PM under General Discussions, Grad school experience, Montreal, Personal. 0 comments. 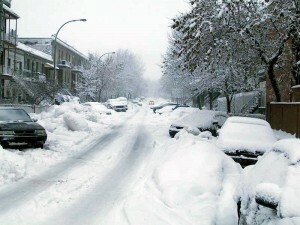 Winter is around the corner in Montreal! 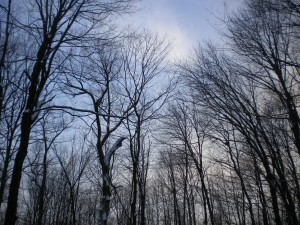 Published by Valerie on 2012/11/24 at 11:18 PM under General Discussions, Montreal. 26 comments. Do they come together? They did this week! 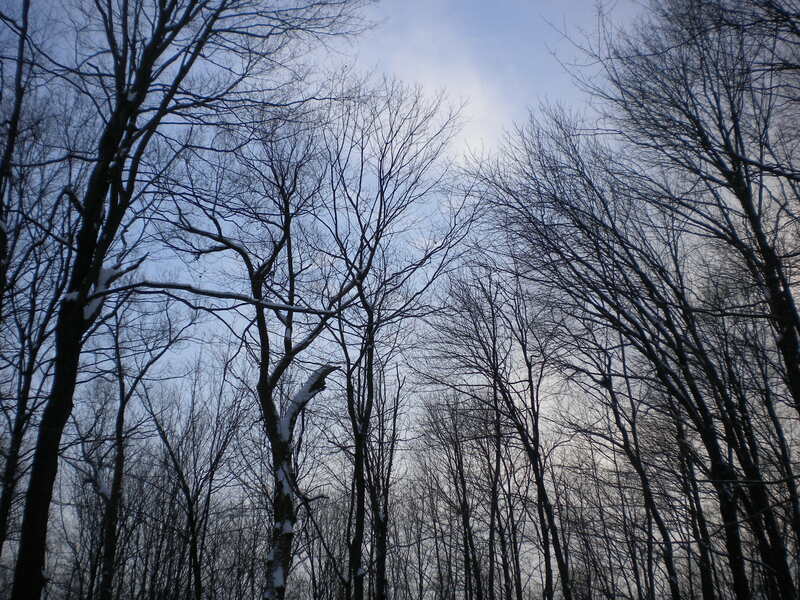 Snow: For weeks, we endured the dry-ish, rainy cold. No one who hasn’t experienced snow would believe it, but snow actually makes things seem warmer. Maybe its the fact that you think its going to be cold because there is snow, and then its not so bad when you actually get out there, has something to do with it. At any rate, we got a dump of snow that managed to stall all the busses that were going to my home. After an hour and a half of waiting for busses and taking the metro to get to other busses that might bring me towards home, I decided to walk from the nearest metro stop to my house. Not a very brief trudge, it ended up taking me a whole hour of trudging. I even got lost once because I couldn’t recognize the city under all that snow. Silence: Definitely has to do with snow. Its as though if there is snow in the air, it acts as a shattered but still effective wall of silence, blocking or muffling all sound. There’s nothing quite like it, and for someone who makes noise for a living, it is a welcome change from the everyday. Success: Probably has nothing to do with the other two. However, I finally had responses from some of the European houses I applied to, and they want to hear me! This is always the beginning of success… Now, all I’ll have to do is convince them that they really want to get to know me better by having me sign a contract for the next year. On the menu: a trip to New York in about a week, and a trip to Berlin in January! So exciting! Published by rebecca on 2010/12/13 at 2:19 AM under Montreal, Personal. 1 comment.